One of my dearest memories of the summer in 1994 that I spent working on an archaeological dig in Jordan was a weekend trip to Petra. We arrived from Amman late in the evening, but several of my fellow archaeology students couldn’t wait until morning to see the amazing structures carved from the sandstone 2000 years ago, so we snuck across wadi after wadi, avoiding the main paths. Once past the guard posts, we walked through the narrow gorge known as al-Siq — pitch black at night — until the passage opened in front of us to reveal Al Kazhneh, lit only by starlight. 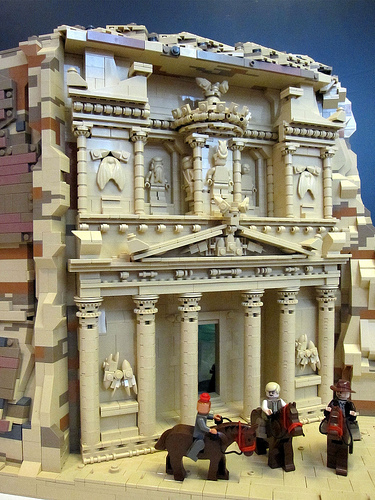 ArzLan built his LEGO version of the Treasury for the Hong Kong Animation Festival, and features Indiana Jones in his Last Crusade visit to this UNESCO Heritage site. Thanks a lot ! Andrew. Cultural heritage is very attractive!